a very Turkish morning. It was sort of damp so instead of sitting outside at the cafe we sat in a sort of tent thing. 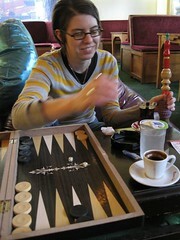 but there were still beanbag chairs and turkish radio and çay (tea) and elma nargile (apple flavored water pipe) and tavla (backgammon). much more fun and relaxing than trying to sightsee in the rain.